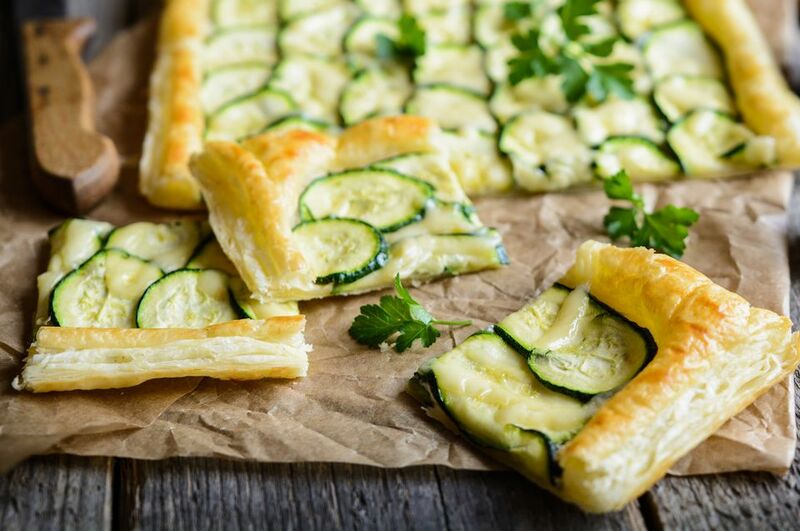 Puff pastry is a light, buttery, flaky dough that is useful for making both sweet and savory dishes, from appetizers to main courses to desserts. It's made from only three ingredients, flour, butter, and salt, yet it can rise up to eight times the thickness of the dough—with no added leavening agent. Puff pastry is made by mixing up a simple dough of flour and water, then placing a slab of butter on top, and folding the dough over the butter and rolling it flat. By repeating the rolling and folding, using one of two basic techniques, the finished dough will contain upward of 1,000 layers. When you bake it, the water in the dough and in the butter produces a burst of steam that puffs up the layers. It's the separation of these hundreds of layers that gives the pastry its light, flaky texture. Do You Need to Make Your Own Puff Pastry? Making puff pastry is not difficult, but before you reach for your rolling pin, remember that it is a painstaking process. The rolling technique required to form those 1,000-plus layers is fairly elaborate: The layers need to be folded in a particular way, usually in either a three-fold or a four-fold technique, which is repeated several times. Because the butter must be cool, it takes considerable pressure to roll it flat. Also, the dough needs to chill in between each round of rolling and folding. The effort is physically demanding and time-consuming. Taxing, repetitive work like this is exactly what machines were invented for! The machine is able to roll out perfectly even sheets, with the butter distributed uniformly throughout. Store-bought, frozen puff pastry is just fine. Frozen puff pastry comes in sheets, which you'll have to defrost before using. The most important thing to remember is to thaw it in the refrigerator overnight. Defrosting at room temperature is inadvisable: Frozen puff pastry sheets come folded (usually in thirds or in half) and if you try to thaw them at room temperature, you'll either unfold the sheets too soon and they'll break, or, once they're fully thawed, they will be too sticky to work with. Keeping the dough cool ensures that it won't stick together, and is easy to cut. To this end, keep your puff pastry dough in the fridge until you're ready to use it; take out only what you're planning to work with right then, and return it to the fridge until you're ready to bake it. Dusting your work surface with flour is to prevent the dough from sticking. Remember to dust your rolling pin as well. It's fine to roll out the sheets a little bit, depending on what you're making, and each recipe should specify how thin the dough needs to be rolled out. However, don't roll it thinner than 1/8 inch as you'll end up squashing the layers together and your pastry won't rise properly. Note that even if you manage to unfold it without breaking, the sheets will still have seams along the fold lines. You can try to roll these out, especially when preparing something big like beef Wellington or baked brie. With smaller items, like pastry puffs, palmiers, or miniature hors d'oeuvre shells, you can use the seams as cutting guides. Always use a sharp blade to cut your puff pastry evenly. Any raggedness or unevenness on the edges of the uncooked pastry dough will magnify eight times when the dough puffs up. Ensure that your knife or pastry cutter is sharp (a pizza wheel works well, too). If you're using round or fluted cutters, remember to press straight down, applying even pressure. In some instances, you might not want your puff pastry to rise, such as with a puff pastry tart: you might want the edges to puff up, but not the center region underneath the toppings. In this case, use a fork to prick the surface of the dough in the area where you don't want it to rise. The tiny holes will allow steam to escape rather than puffing up the layers of pastry. A good recipe will guide you on whether and where to dock the pastry. Prevent sticking: Use a silicone baking mat or parchment paper to prevent the pastry from sticking to the baking pan. Save your scraps: If you're making a beef Wellington, you can cut your scraps into decorative shapes and use an egg wash to glue them to the outside of the pastry. Add a finishing touch with egg wash: In addition to helping glue decorative bits of puff pastry, egg wash will seal edges together, and impart a golden, glossy sheen to the baked pastry. Freeze uncooked pastries: You can freeze uncooked pastries for up to two weeks, and transfer them directly from the freezer to the oven.